Take a trip through time at the Rodin Museum in Paris. Explore his unique vision of the world and of the human body and soul. This rare treasure is missed by many visitors! A visit to the Rodin Museum is a unique experience, in that the focus is not solely on art, but on the garden and the artists living space, from which we can recreate and understand the historical context of Paris and indeed entire France of its time. During a 2 hour guided tour youll see some of the most famous works of Rodins art as well as some of the less known, but equally important ones. Marvel at the artwork, but also at the unique interior and the lovely garden. Witness his unique artistique and aesthetic vision, as well as his tumultuous life, unravel before your eyes. See the very original thought that changed the history of art incarnate in bronze and stone! Delve into the history of Frances most famous rulers and artists on this private tour of Les Invalides and the Musée Rodin. 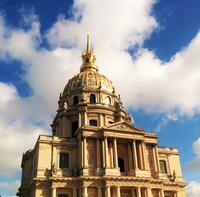 Explore Les Invalides, widely considered one of Paris most interesting historic sites. Learn about the roles its monuments and museums have played in the citys history. Behold the tomb of Napoléon Bonaparte, surrounded by symbols of his famous achievements and military victories and completed in 1861. Visit the 17th-century Cathédrale St Louis with your guide, and admire world-famous sculptures from famous French artist Auguste Rodin at the Rodin Museum. Head to Les Invalides in central Paris to meet your guide, an art historian, before setting off on this 3-hour walking tour. With a fascinating history going back to the 17th century, Les Invalides is the perfect place to begin to explore the city. Explore the complex of beautiful buildings and marvel at the many magnificent monuments and museums along the way, including Musée de l'Armée (Army Museum) and Musée d'Histoire Contemporaine (Modern History Museum). Listen as your guide details the cultural, political and social struggles that have played out at Les Invalides over the years, including how it was stormed in 1789 and the weapons seized were used in the infamous Bastille riots in July that year. Visit the Cathédrale St Louis and ogle its many banners won by French armies on battlefields. Delve into more military history while exploring some of the armories. Visit the tomb of Napoléon Bonaparte, the military and political leader famous for guiding the nation through the end of the French Revolution, and gain insight into one of the worlds most powerful and successful rulers. For the next part of your tour, head along the Boulevard des Invalides to the Rodin Museum, where famous French sculptor Auguste Rodin lived and worked in the early 20th century. The museum and its beautiful gardens are today home to many of Rodins most famous works, including The Thinker, The Kiss and The Gates of Hell. Explore the galleries with your guide and gain an appreciation of the life and works of this most original and creative French artist. The tour concludes at the Rodin Museum. After going through months of refurbishment, the Musee Rodin in Paris reopened in November 2015. It has been completely transformed. It is hidden behind the facade of a beautiful private mansion from the 18th century that is housing the permanent collections of the Musée Rodin. Your entrance ticket will give you access to the famous sculptors masterpieces as well as works by his mistress Camille Claudel. Wandering through the gardens and the museum itself, you will discover some of Rodin's major piece of arts: The Thinker, The Burghers of Calais and The Gates of Hell. Pick up tickets at an office close the the Eiffel Tower, then make your way to the Musee Rodin on your own scheduleyoull walk right past the lines to buy tickets at the museum. Rodin moved into the Hotel Biron, where the museum stands today, in 1908 and continued his work there until his death. The museum includes 400 pieces of art in its galleries and in the sumptuous gardens. Perhaps the most famous of Rodins sculptures, The Thinker (1880), lies in the gardens opposite The Gates of Hell, a work that consumed him over the last three decades of his life. Rodin died before completing this sculpture representing scenes from Dantes Inferno. Some of the other works located in the gardens include Balzac and The Burghers of Calais. Rodin worked on many busts of friends and famous figures, including the French writer Victor Hugo, the Austrian composer Gustav Mahler, and the English socialite-turned-writer Vita Sackville-West. One of the worlds most famous sculptors is on display in the mansion where he worked for years creating and collecting artifacts. On this 1.5 to 2 hour private tour, you will explore rooms filled with Rodins personal collection and artwork. Your expert guide will share the stories and secrets behind the most iconic works, helping you to understand this French artist and the role he played in the 20th century art. The rooms are studded with sculptures and selections of more than 200 paintings that Rodin had accumulated over his life. Youll explore his various studies of the human form, including numerous hands and the life-sized The Walking Man. Learn about his contemporaries, whom he depicted in clay, like the French writer Balzac. Discover the details of his masterpiece, The Gates of Hell, including the most recognizable of Rodins work, The Thinker. After exploring the inside of the museum, you can stroll the beautifully manicured gardens where more sculptures are on display. Through this epic collection of his works, youll learn all about this renowned artist who became, even if unwittingly, a father of modern sculpture. One of the worlds most famous sculptors is on display in the mansion where he worked for years creating and collecting artifacts. On this 1.5 to 2 hour semi-private tour, up to 6 guests will explore rooms filled with Rodins personal collection and artwork. Your expert guide will share the stories and secrets behind the most iconic works, helping you to understand this French artist and the role he played in the 20th century art. The Eiffel Tower is spectacular, but theres more to this part of Paris than meets the typical tourist's eye. On this 3-hour walking tour, you'll get a deeper look at the historic 7th arrondissement, Paris' noblest district. Marvel at The Thinker and other famous sculptures in the gardens of the Musée Rodin, stop to enjoy some fine cheese and pastries and see where Napoleon is buried at Les Invalides. Views of the Eiffel Tower from the Champ de Mars wont disappoint, either. Your group size is limited to eight to ensure a personalized experience. Meet your guide near Les Invalides in the morning and set off on your 3-hour walking tour of central Paris. The focus of the tour is the 7th arrondissement, on the left bank of the Seine River. Here is where some of Paris most famous monuments and attractions can be found, including the Eiffel Tower, Hôtel des Invalides and world-famous museums such as the Musée Rodin. Listen as your guide explains the history of this famous area, which has been home to members of the French upper classes and aristocracy since the 17th century, when it became the new residence of high nobility. Stroll through the beautiful sculpture-filled gardens of the Musée Rodin, crowned by the famous The Thinker statue before discovering the museums and monuments in the area around Les Invalides, many of which relate to Frances military history. Admire the iconic dome of Les Invalides, inside which lies the tomb of Napoleon. True Paris opens itself up as you saunter down busy main boulevards and intimate side streets where locals shop, meet and go about their daily business. Stop at local producers for three food tastings, such as pastries and cheese, and perhaps enjoy a little conversation with the vendors en route. Enjoy close-up views of the Eiffel Tower as you wander the open parkland of the Champ de Mars, following your guide down less-trodden paths surrounding the city's most iconic structure. After three hours discovering the hidden secrets of this popular and attractive part of Paris, your tour concludes near the Champ de Mars. Since there is already a rule about giving way to right at any intersection, there is only one stop sign within the confines of central Paris (it's in the 16eme). Well, usually there is. Given its uniqueness, it gets stolen a lot.